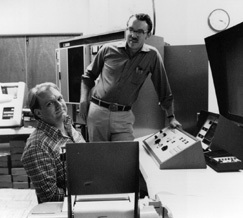 Charon discoverers James Christy (seated) and Robert Harrington in 1978. In June 1978, U.S. Naval Observatory astronomer James Christy noticed something unusual. He was studying highly magnified photos of Pluto, and Pluto wasn’t round. A small bump marred one side of blurry Pluto. That bump turned out to be Pluto’s largest moon, Charon, whose discovery Christy (working with late colleague Robert Harrington), made on June 22, 1978. 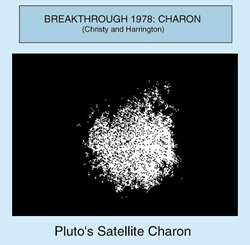 Like Pluto in 1930, Charon was found using photographic plates taken in Flagstaff, Arizona. Thirty-seven years later, Charon is about to be revealed by NASA’s New Horizons mission. As New Horizons draws closer by nearly a million miles a day, every observation of it brings new knowledge about this mysterious moon – a world far larger than even the largest asteroid, Ceres. “Even though Pluto and Charon are partners, they are known to be quite different in appearance and composition. As New Horizons reveals them in far greater detail than ever before possible, we hope to find out why that’s so,” says Alan Stern, New Horizons principal investigator from Southwest Research Institute, Boulder, Colorado. At 750 miles in diameter, Charon is half Pluto’s size. However, it weighs only 12 percent as much as Pluto. This suggests that Charon may be half ice and half rock; Pluto, by contrast, if about 70% rock by mass. The pair form what planetary scientist call the only known binary planet in the solar system. Pluto and Charon are tidally locked, circling their common center of gravity once every 6.4 days. As a result, an astronaut on Pluto’s surface would always see Charon in the same part of the sky, but appearing seven times larger than Earth’s moon, spanning 3.5 degrees on the sky. Charon and Earth’s moon are believed to share a similarity in that both are thought to have been born out of giant impacts early in the solar system’s history. In the case of Pluto and Charon, it may have been more of a grazing impact that left both objects largely intact but may have also formed Pluto’s retinue of at least four other small moons. Additional moons, or even dust rings, may await discovery by New Horizons. Ground-based observations have shown that while Pluto’s surface is covered with frozen nitrogen and methane, Charon appears to be primarily covered in water ice. Charon could even be dotted by icy volcanoes bubbling a slushy mixture of water and ammonia, and it may have an atmosphere, perhaps siphoned off Pluto. In this clip from "Plutopalooza," at California Academy of Sciences on April 25, 2015, science teacher Randy Monroe tells the story of how his stepfather, James Christy, discovered Pluto's moon Charon.